This page is currently under construction. If you need information now, please visit our links section. United States of America (formerly the 13 colonies), France, Spain and The Netherlands. Brunswick, Waldeck, Brandenburg-Anspach, and Anhals-Zerbst. Some People in the Revolutionary War-- A listing of important people in the Revolution. The Hessian Web Page An interesting web site detailing the activities and origins of the Hessian forces in the war. 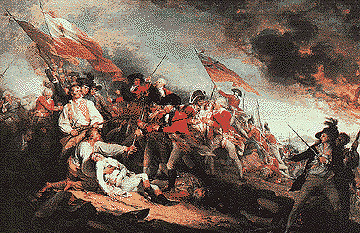 The War for American Independence Good web site containing links to Revolution-era documents and a chronological list of battles. Revwar.com Well-organized Revolutionary War site. U.S. History Outlines & Charts Informative site maintained by a fellow high school teacher. Data is available on most periods of U.S. History. Lee, R. "The History Guy: The American Revolutionary War"
Lee, R. "The American Revolutionary War"
The Second Indochina War "Vietnam War"